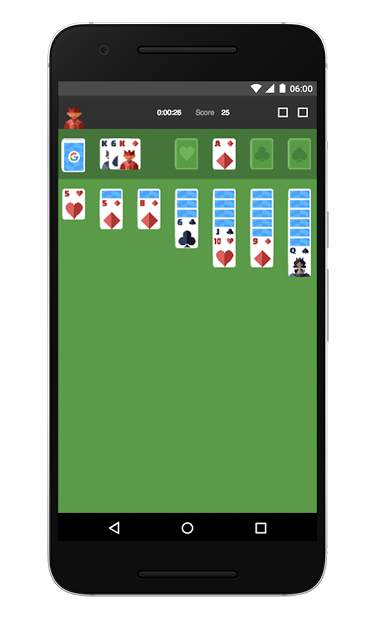 Looking to waste time with a round of solitaire on your phone? You no longer need a separate app for that – Google today is rolling out a couple of simple games right into its search engine and standalone Google Search app, the company says. It’s making two of the most popular, classic games of all time – solitaire and tic-tac-toe – available both on the desktop web and in its search app. To access the games, all you have to do is search. For example, type in “solitaire” into the search box, and the game will pop up as a card in the search results. Tap it, and you’ll be taken to a full-screen version of the game, where you can select your difficulty level ahead of gameplay. The cards feature little Google logos on them, and there are some basic settings you can use, as well – like turning off the sound, undoing your last move, or restarting the game when you’re out of moves. If you Google for “tic-tac-toe” or “tic tac toe,” you’ll also see a playable game in a card in the search results. You can adjust the settings here to Easy, Medium or Impossible. You can also play against another person and choose whether you’re “X’s” or “O’s.” Meanwhile, Google will keep track of your score across rounds. While neither of these games are anything remarkable in and of themselves, it’s an interesting experiment in turning Google’s search app into something more than a utility for accessing information. The company in the past has offered games at times as part of its interactive Google doodles, like the one it did recently for the Olympics, or that awesome, playable Moog Synthesizer, for example. But these would only live briefly, and were things people happened on by chance, not because they launched Google with the intention of playing a game. A minor move like putting games in search means that users – especially mobile users – will turn to the Google search app at a time when a lot of the information we need is available elsewhere on our devices – via virtual assistants like Siri, which can answer basic questions, for instance, as well as in other standalone native applications. Decreasing our reliance on Google to scour the world of apps means the company could eventually see its ad business impacted, too. So, sure, these new games are fun – but they’re not entirely without an ulterior motive. The games are live now on the desktop and in the Google app.